We are excited to hear this news! Please check out Moyer Winery if you get a chance. 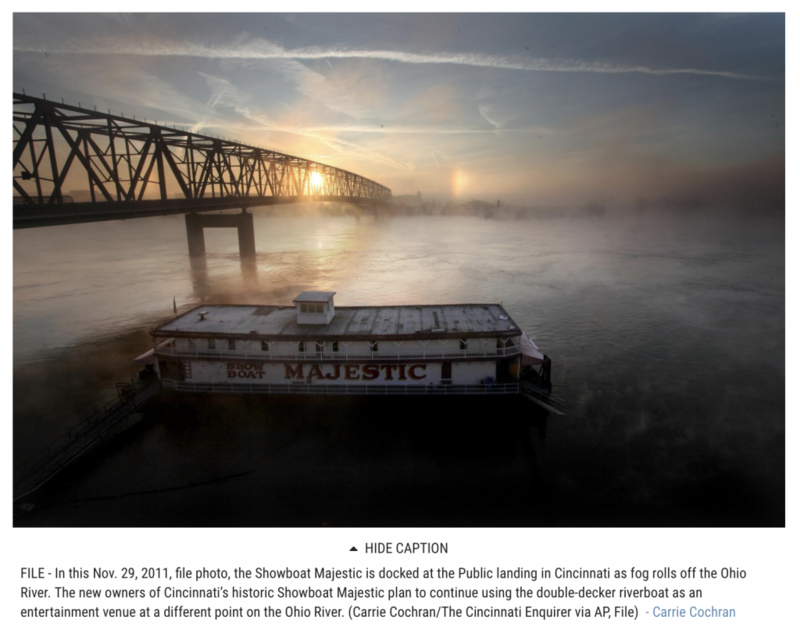 CINCINNATI (AP) — The new owners of Cincinnati’s historic Showboat Majestic plan to continue using the double-decker riverboat as an entertainment venue on the Ohio River. Adams County real estate agent Joe Brumley and his wife, Cortnee, bought the country’s last floating theater for around $110,000 this month, WCPO-TV reported . Cincinnati had put it up for auction, citing high maintenance costs. The boat, built in 1923 in Pittsburgh, Pennsylvania, is listed on the National Register of Historic Places. Cincinnati bought it from Indiana University in 1967, and it sat for years at the city’s Public Landing before it was sold. The Brumleys plan to move the boat to Moyer Winery in Manchester, a town on the Ohio River that’s about 55 miles (89 kilometers) southeast of Cincinnati. Joe Brumley said they hope to create a new tourist attraction there using the Majestic and a previously purchased sternwheeler, the CT McFarland, which they bought to give cruises around the nearby Twin Islands. Before that happens, there will be restoration work on the showboat and other preparations for the attraction. Moving the Majestic will cost more than twice the auction price, but the Brumleys are hoping it will pay off in drawing people to the area. The move is expected to happen within the month. “Getting it here and really making sure the Majestic, this relic, stays alive, we need everybody’s help,” Cortnee Brumley said.